What a Summer it’s been for the UK’s leading automotive paintwork repair brand ChipsAway, who have smashed all previous records with the Franchisor generating an unprecedented level of demand in terms of repair leads for their UK wide network of franchise partners as a result of a major investment in ongoing, national marketing activity including TV advertising and extensive online exposure! In the past three months alone, not only have ChipsAway managed to generate well over £9.5m worth of repair leads for the network (up almost 300% compared to before TV started), but they have also seen website traffic increase substantially by 17.3% compared to the same period last year. 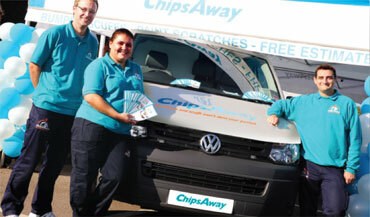 ChipsAway, who have been established in the UK for 20 years, provide high quality on-the-spot repairs to minor damage such as paintwork scratches, bumper scuffs and kerbed alloy wheels. Repairs are completed within a matter of hours and at a fraction of the cost of traditional body shop repair methods. With 34 million cars on the road and over 22 million repair opportunities each year, demand for ChipsAway repairs is higher than ever before.